Kale Waldorf Salad Recipe - Gluten Free, Vegan, Healthy & Delicious! I don’t know about you, but after so much heavy food during the holidays, I am so ready to get my veg back on. 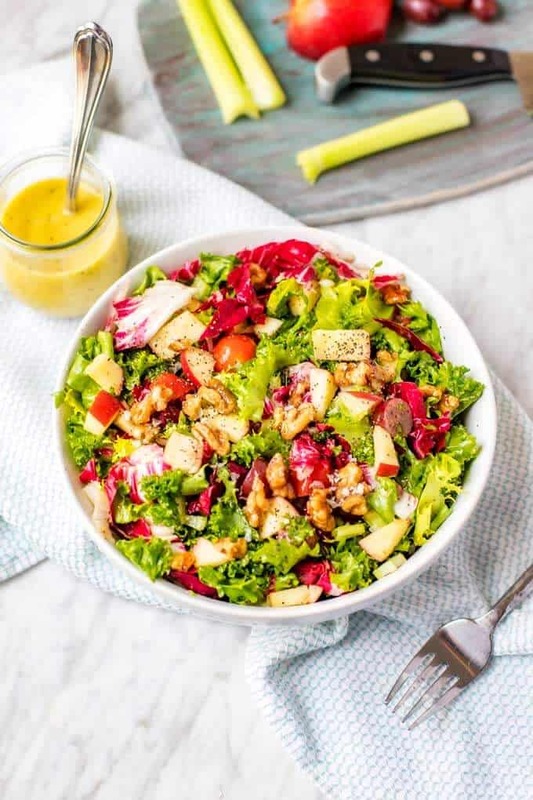 I’m committed to eating salad for at least one meal a day this month, and today I’ve got a fun Kale Waldorf Salad that you are going to love. Now, I know – this isn’t your traditional Waldorf Salad. 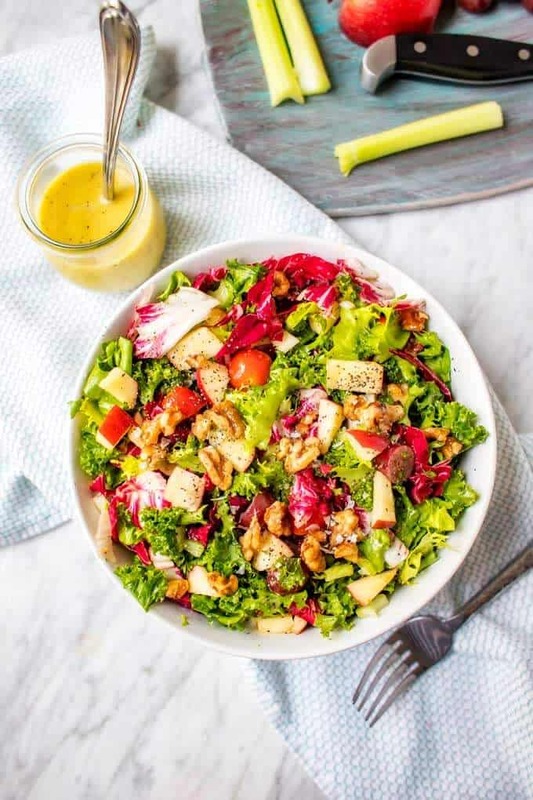 There is no creamy dressing, and we all know that Waldorf Salad doesn’t typically include kale. 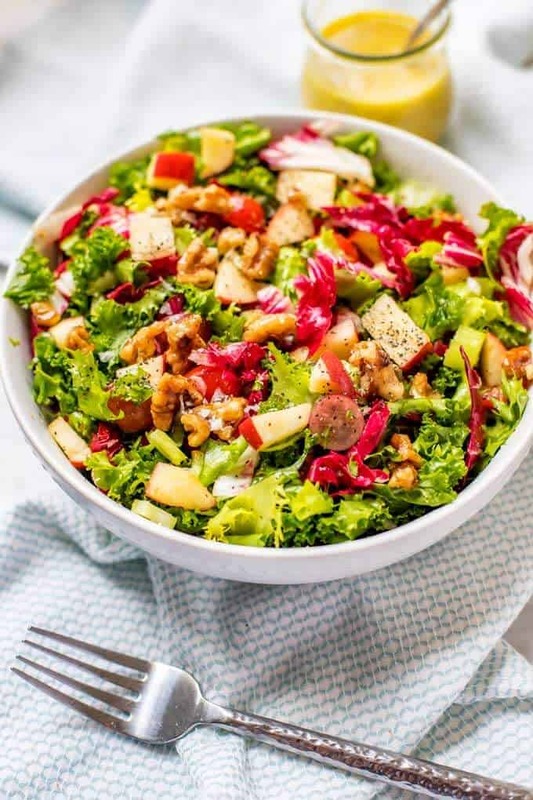 Don’t let that stop you from trying this Kale Waldorf Salad Recipe! 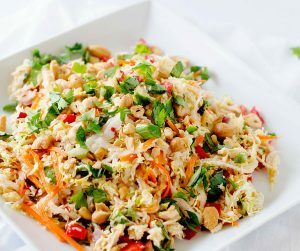 Packed with nutrition, this delicious salad features a delicious lime vinaigrette with a kick of ginger and sesame oil. I’ve gone heavy on the greens here, because…January. Feel free to reduce the amount if you aren’t feeling it. Also, if bitter greens aren’t your thing, romaine and/or spinach would sub in nicely for the endive and radicchio. Place a skillet over medium high heat. Add walnuts, coconut nectar and sea salt. Cook, stirring constantly for about four minutes. Remove walnuts from pan and all to cool on parchment paper. Combine lime juice, rice wine vinegar, ginger, garlic, extra virgin olive oil, dark sesame oil and Swerve in a blender. Process until smooth. In a large bowl, combine kale, endive, radicchio, apple, grapes, celery and tomatoes. Toss with dressing and serve. I love kale! and this salad looks so appetizing! i am looking for new lunch box ideas! this is perfect! Oh my goodness. This looks so good and I have 3 kinds of kale growing in the garden right now. I will pin for later. This salad looks so good. I just love how healthy it is. Now that is a delicious recipe for yummy lunch. I love your twist on the traditional waldorf salad. This looks absolutely delicious! I have been meal-prepping lots of salads for lunch, so I’ll try this one next week. Thanks! That looks almost too good to eat! I would love to make this one. Wow, that is one delicious salad! My body loves the freshness. I’m not a fan of kale, but this salad looks AMAZING! I’m definitely going to try this recipe! Lunch PERFECTION. 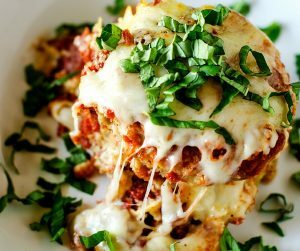 Tons of flavor, low carb and actually filling. It’s a winner in my book! Looks really good I love Kale. I have to try the way you made it. Saving thanks for sharing. Wow!! 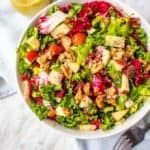 I am looking for a new salad recipe to try. 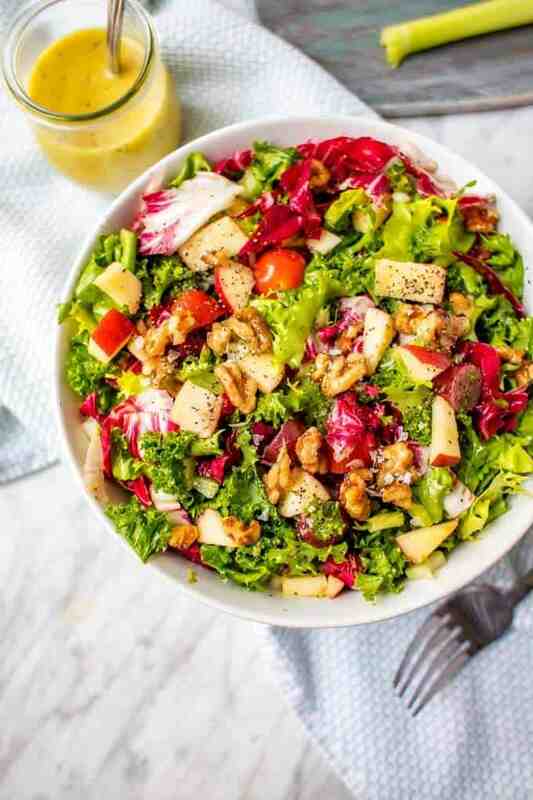 and this kale Waldorf salad recipe looks so delicious and nutritious as well. Will try this one. This salad looks delicious. I want it. Love it!